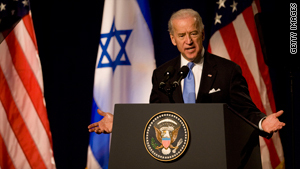 Vice President Joe Biden issued a strong statement while in Israel condemning the announcement about the settlements. Washington (CNN) -- Relations between the United States and Israel have been rocky at best since President Obama and Prime Minister Benjamin Netanyahu both took office, specifically over the U.S. demand for Israel to stop settlement activity and the Israeli refusal to do so. But Israel's announcement last week about a new settlement project in East Jerusalem and the U.S. reaction has sent the relationship into a significant downward spiral. Vice President Joe Biden issued a strong statement while in Israel condemning the announcement, but by the end of his trip, he was back to the more familiar language about the unshakable bond between the United States and Israel. But Secretary of State Hillary Clinton told CNN that the timing of the announcement was "insulting." Her comments followed a tense phone call with Netanyahu in which aides say she demanded a reversal of the decision on the East Jerusalem settlements and additional gestures by Israel to the Palestinians to demonstrate its seriousness about negotiations. The same day, after a tough meeting with Deputy Secretary James Steinberg, where he received a strong rebuke over the timing of the announcement, Israeli Ambassador Michael Oren, in a conference call with Israeli diplomats in the United States said the U.S.-Israel relationship was in crisis, according to an Israeli official who participated on the call. Video: Strain on peace process? After years of lukewarm reactions to such statements about new settlements by Israel, the United States chose to push the envelope, turning the incident into a crisis. Why? Maybe it was to show Israel that the United States is not going to accept everything Israel tries to do. Maybe it was to gain some "street cred" with Arab leaders, whose opinion of the Obama administration as weak on the Middle East is increasing with every brick of settlement activity. Even if the United States is able to change both of those perceptions, however, it is unclear where Obama goes from here. The problem is, the current fight with Israel doesn't do any of these things, least of all improve the climate for peace talks. The Obama administration is waiting for a signal from Israel that it is serious before it sends its Mideast envoy George Mitchell back to the region to resume talks. If Clinton's call for Israel to rescind the decision on the settlement project goes unheeded, U.S. credibility in the region will plummet even further. But it is unlikely the U.S. will push the Israelis as far as they are eventually prepared to push until they are convinced there is a leader on the other side that has the political will and clout, both to negotiate a deal and sell it to his people. While senior administration officials believe Palestinian Authority President Mahmoud Abbas is a "man of peace," they acknowledge he is a weak leader whose ability to unite Palestinians around a peace deal is questionable. Case in point: After securing Arab cover for the indirect peace talks with Israel under the auspices of the United States, Abbas now says he won't join the talks until Israel rescinds the decision on the East Jerusalem settlement construction. That might seem surprising. In diplomatic circles, "negotiating 101" is strike while you are on top and your opponent is weak. Instead of agreeing to talk when Netanyahu is at his absolute weakest -- having incurred the ire of the United States and facing fire from conservatives within his fragile coalition, who are believed to be behind the settlement announcement -- Abbas is putting conditions on even talking to the Americans. The United States `might wonder if Abbas has what it takes to push this through if he isn't capitalizing on a possible advantage. And that won't exactly inspire the kind of confidence the U.S. will need to gamble with its relationship with Israel. Most importantly, a crisis such as this between the Obama and Netanyahu administrations will not shift the United States commitment to Israel's security. And Israel knows that. It has made the calculation that its own interests on settlements and maintaining its position on negotiations with the Palestinians is more important than public relations with Washington. The message for the Obama administration is this: if you are going to pick a fight, make sure that you win. Because otherwise, it won't just be the United States or the Israelis or the Palestinians that end up the losers. Unfortunately, the peace process will be the biggest casualty.